This battle of unbeaten will be between No. 5 Udall and top-ranked Hanover. Udall quarterback Nolan Williams has passed for more than 900 yards and rushed for more than 800. Junior Dalton Loos has rushed for more than 1,200 yards with 23 touchdowns, while sophomore Sweed Wilkey has 440 yards receiving. Udall is averaging almost 400 yards of offense per game. Hanover has rolled through its schedule, scoring at least 50 points in every game. The Wildcats are coming off impressive lopsided victories against Osborne and Madison. Quarterback Andrew Bruna rushed for about 130 yards and passed for about 130 yards in the win against Madison. One of the premier games in all of Kansas this weekend, Spearville and Central Plains are both undefeated with sterling resumes. Spearville owns a neutral site victory against Madison and road wins versus Ness City and Hodgeman County. Central Plains is the lone team to defeat Victoria, has beaten Little River and easily defeated high-octane offenses in Solomon and South Central. 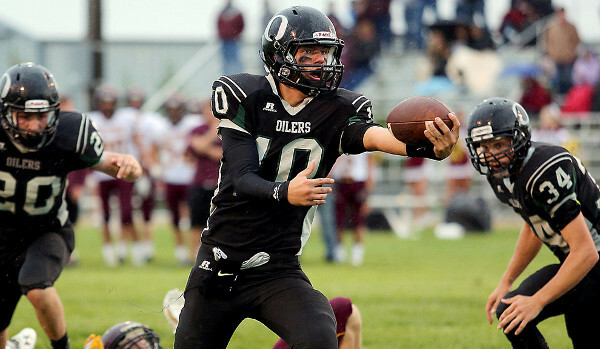 Central Plains coach Chris Steiner has taken exception to the perception surrounding his team. Many believe CP has taken advantage of an easier schedule, but the Oilers rank No. 1 in Eight-Man, Division I in scoring defense and No. 2 in scoring offense. Spearville is No. 3 in scoring offense. Both squads are filled with exceptional athletes and quarterbacks, including Braedan Crites for Central Plains and Spearville’s Nathan Stein. Michael Ryan has put together a great season on defense for the Oilers. The game will come down to three areas: Can Central Plains slow Spearville’s vaunted single wing attack? Spearville has a tendency to get out to big early leads. Can Spearville’s strong defensive backfield contained Oiler standout receivers Layne Bieberle and Michael Lamatsch? Both squads have strong returners – will the kicking game or short fields play a role? I think Stein’s ability to make plays happen in space will be the biggest difference. Spearville has been my No. 1 ranked team for nine weeks. Preppowerindex.com, in its playoff predictions, has Spearville by six points. I agree.